Fight To Win Pro 70 is stacked with competitors from one of the East Coast’s most talent-rich organizations: Team Lloyd Irvin. A staggering 14 of the 25 matches on the card feature TLI students, and we expect an excellent showing by the competition-centered squad this Friday in Baltimore. Read on to see some of our favorite matches from the upcoming event. Tim Spriggs is at the peak of his career, and Gutemberg Pereira is the prototypical hungry rookie. Both employ explosive, action-packed jiu-jitsu. Both are only satisfied with a submission win. This match is going to be a war. Shane Jamil-Hill Taylor is another highly touted prospect out of TLI. Supremely technical, Hill’s style is both aggressive and mind-blowingly creative—he ran through Samir Chantre at Pans with surprising ease and has been battling it out with Gianni Grippo for the past few years. Bruno Cesar represents GF Team and is a masters competitor with a silver medal at Pans. He’s got a huge challenge in front of him with Jamil, but he should pull off the victory. Devhonte Johnson is one of the most highly touted brown belts on the competition scene today. Representing Unity jiu-jitsu, Johnson brings a smash-mouth style and undeniable heart to all of his matches. He’s been training under the watchful eye of Murilo Santana and is a regular training partner of monsters such as Dillon Danis, the Miyaos, and Felipe Cesar. 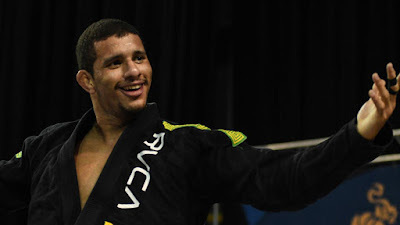 Malachi Edmond has quietly been building his resume and is another brown belt with limitless potential. A TLI product from day one, Edmond has been chasing down gold medals at IBJJF International Open events and hit the podium at Pans in 2017. He faces Ellis Karadag, a recently promoted brown belt representing Method MMA, who’s had success at regional open events.